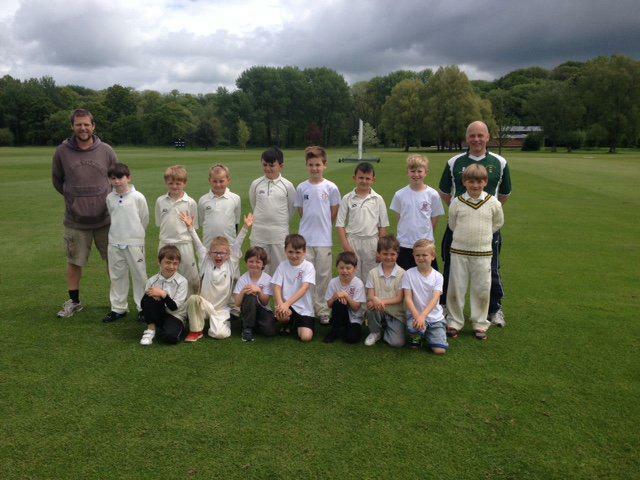 A team of cricketers from Year 3 and Year 4 enjoyed a day of cricket in the lovely grounds of Bryanston School on Friday 22nd May. The boys all performed brilliantly, winning 7 out of 8 matches played against local primary schools. We had a great day and special thanks to Mr Moore for organising and to Mr Coleman and other parents who came along to help and support on the day. 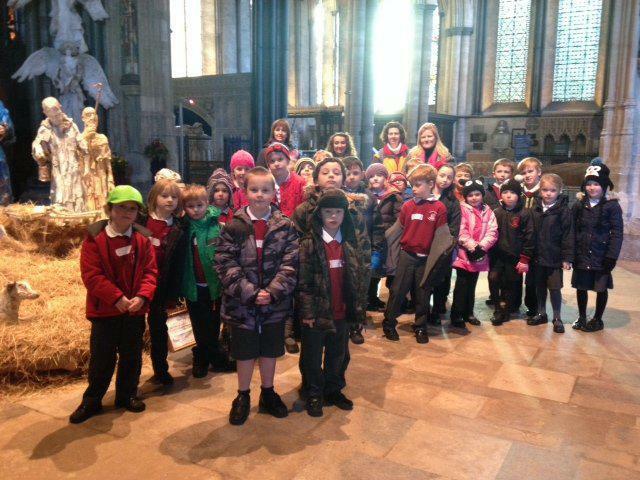 Woodpeckers class enjoyed an educational visit to the cathedral. We explored Spirituality through the themes of Windows, Doors and Water and everyone produced some creative work which will be on display in our school hall. Please have a look when you are visiting for Parents' Evenings. Thank you to our helpers - Mrs Pitman, Mrs Ellis and Reverend Annesley-Gamester. 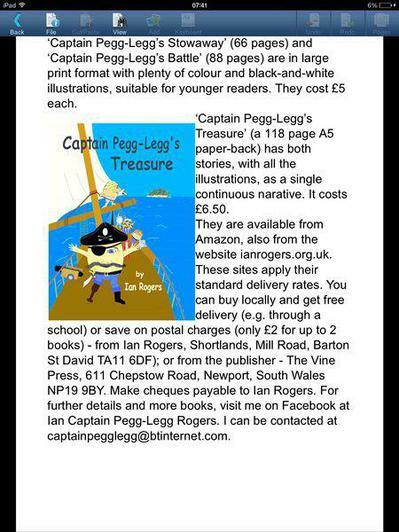 We are delighted to welcome a local author, Ian Rogers into School on the 28th January. Ian will be reading some of his latest book with years 3/4 and holding a workshop with them for the afternoon. There will be an opportunity to purchase the book on the day, or a flier will be emailed to you, with the class newsletter, to purchase online. We had our Christmas party today and had a lot of fun dancing around and playing games. May we take this opportunity to wish you all a happy and safe Christmas, and we will look forward to seeing you all in the New Year! Advance notice - the class will be going to Salisbury Cathedral on 28 March 2014 for the above workshop. We will be travelling by coach, leaving at approximately 8.40 am and arriving back at school at around 3.30 pm. Further details will follow in due course. Well done to all of the children for writing lovely Harvest prayers. We combined lots of ideas together to form one for the Harvest service in Church today. 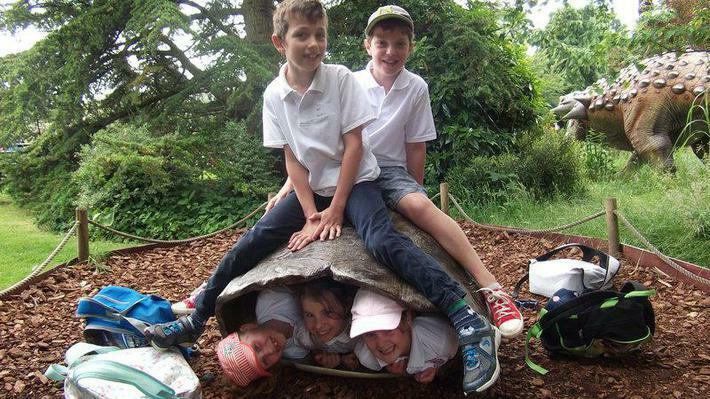 We had a fantastic time at Bristol Zoo on friday. The children saw many different animals, and were absolute super stars the entire day. Well done year 3, I hope you had as much fun as I did! Don't forget we start our swimming this week. Swimming will be on a Thursday morning. Children should remember to bring their swimming kit in, including a hat. Veruccas ideally should be covered with a plastic sock. Swimming club begins this Friday after school, til 4pm. On Thursday 5th May we will be going on our summer class trip to Dorchester to visit the museum and the Roman House. We studied The Romans last term in History, learning all about their invasion of England, how they lived, their fashion, currency and buildings, and their lifestyles. Mr. Lewis, being a keen archeologist, showed us artefacts which included clay roof tiles and cooking pots. We're looking forward to our trip. 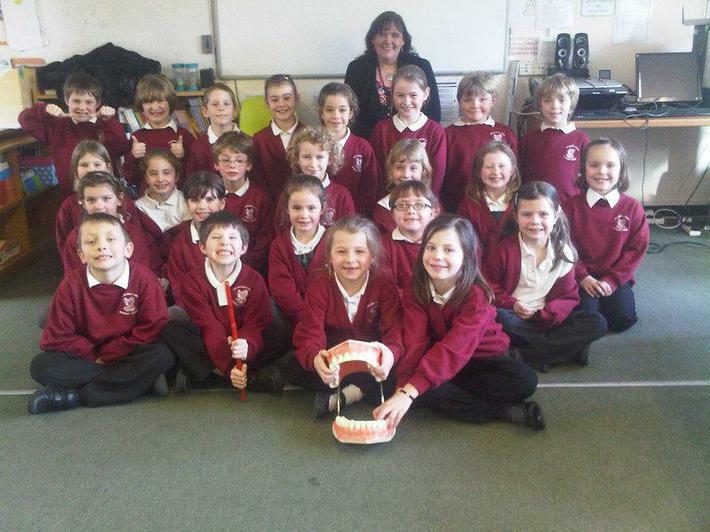 On Tuesday 1st February Debbie from Dorchester Hospital came to visit Year 3 to talk about TEETH and healthy eating. We learnt about how sugar reacts with the plaque that builds up around our teeth and gums, making an acid that loves to eat enamel, and makes holes in our teeth. We also learnt that sugar has many different names such as glucose, sucrose and dextrose, and is in lots of the processed foods we eat, and that the best time to eat foods with sugar in is at proper meal times rather than in between meals. Debbie's giant teeth and toothbrush were perfect models for showing us the correct way to brush our teeth and gums. We need books, cds, dvds, and games for the Year 3 stall at the school fete on 10th July. Items can be sent into school with your child or left at the main reception from the week beginning the 5th July right up until the day of the fete. We'd really appreciate anything you can bring in. If you have any other items you'd like to bring in please so - other classes are running stalls too selling cakes and teddy bears. Ask at the school reception for more information. On Friday 21st May Year 3 will be attending a striking and fielding festival at Sturminster Newton High School. Children will leave and return during school time, and should take drinks, snacks and lunch with them. Note to parents: Don't worry if you've already paid for a hot school lunch as you will have a credit to be used on a future order. Children should wear normal PE kit to school and bring equipment suitable for the weather ie. tracksuit/sweatshirt, or have suncream applied before coming to school. Photos will be on the website soon. Tomorrow (Friday 14th May) year 3 are going to the Octagon Theatre in Yeovil to see a theatre production of Roald Dahl's George's Marvellous Medicine. Watch this space for reviews and photos soon! This week Year 3 went to Bath to visit the Roman baths. We dressed up in togas, made mosaics and learned about some of the amazing Roman inventions like under floor heating (hyper caust) and how they built and decorated their villas. After lunch we had a tour of the baths and with the aid of audio handsets we learned about their history, how they were built, what they would have looked like in Roman times and who would have visited them. We'll be putting some pictures up soon! At the beginning of the Spring Term Year 3 planted daffodil bulbs to help raise money for Marie Curie Cancer Care. We raised £94 for the charity. This money goes towards enabling Marie Curie nurses to support patients in their homes. Many thanks for your generous donations. Woodlice having a rolling race was a book that both Reception and Year 3 enjoyed. It was read to us by the author, Mr Patrick Caruth and we had the opportunity of interviewing Mr Caruth about his writing. Home and Family - he lives with his 2 children(11 & 13 years),his wife (an artist), spaniel named Oscar and cat named Treacle. They live in the village of Rimpton. Background - the author was born near Bridport and worked in Scotland and London. He is now back in Dorset for good! Writing Career - seven years ago Patrick started writing. His children were playing at the bottom of the garden with some woodlice on a rock. 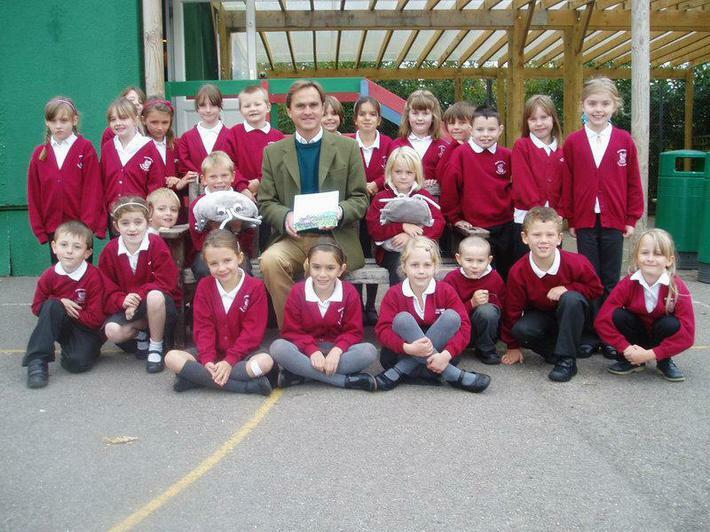 He began to tell them stories about woodlice and they were so good he decided to write a book. 'The Rolling Race' has a print run of 2,000 books. Three more books are waiting to be published. Thoughts on Writing - Mr Patrick Caruth thought it was fun writing and even more so when you see your book printed out. "It is easy when you have lots of ideas but it is not easy publishing your book." Other interesting facts - Year 3 found out that Mr Caruth did not train to be an author. He trained to be an airline pilot to take people on holiday to North America and Africa. He also flies jets. His favourite book is 'Winnie the Pooh' because the characters came to life for him as a child. If you want to know more go to www.woodliceworld.co.uk or phone 0845 121 4724. On Monday 19th October we are to be visited by Mr Patrick Caruth. He has written a book titled 'Woodlice World'. We will be interviewing him about his writing, his interests and lots more. See this page for the full interview.